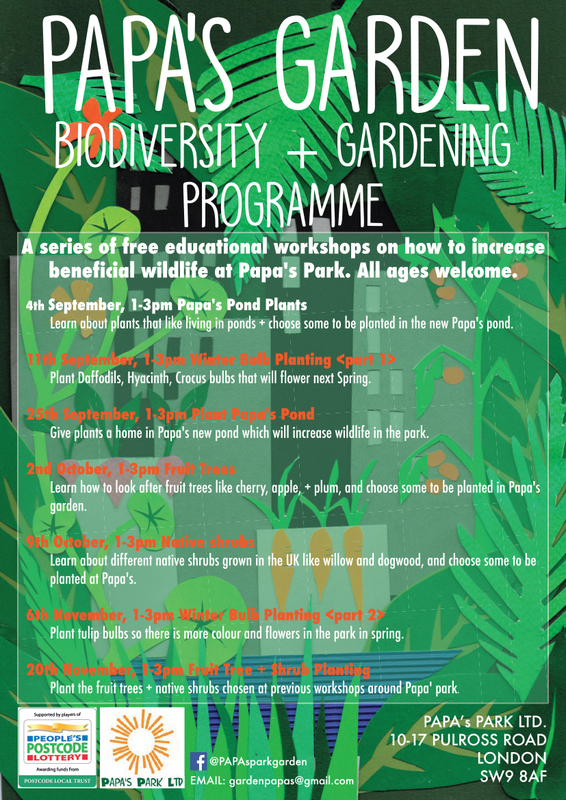 Papa’s Park – Gardening + Biodiversity Programme – starts 4th September! A series of free educational workshops on how to increase beneficial wildlife at Papa’s Park. All ages welcome. Learn about plants that like living in ponds + choose some to be planted in the new Papa’s pond. Plant Daffodils, Hyacinth, Crocus bulbs that will flower next Spring. Give plants a home in Papa’s new pond which will increase wildlife in the park. Learn how to look after fruit trees like cherry, apple, + plum, and choose some to be planted in Papa’s garden. Learn about different native shrubs grown in the UK like willow and dogwood, and choose some to be planted at Papa’s. Plant tulip bulbs so there is more colour and flowers in the park in spring. Plant the fruit trees + native shrubs chosen at previous workshops around Papa’s park.